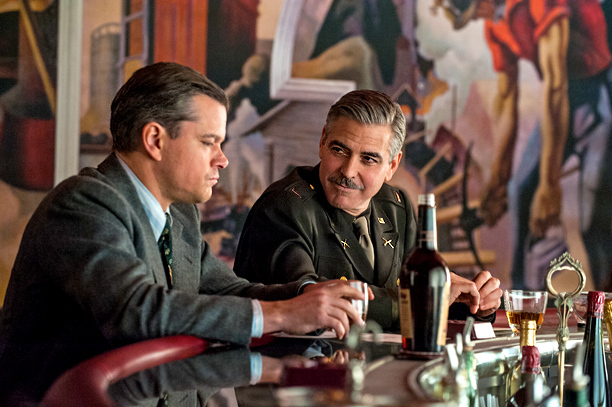 Monuments Men, being based on a true story, meant it was always going to be decent in my eyes, as I really do love stories based on fact. But with it also being directed by George Clooney, as well as starring him and Matt Damon really did add weight behind something to a point that it was almost a guaranteed good time. Well, at least for me, as I know those actors have their haters out there. Though I wasn’t sure from the trailer what the actual tone would be, as they used some great comedic actors, but at the same time it dealt with a subject matter that could be fairly dark, as are most films based around WW2, and especially the Nazi’s. So when I picked it for my date night choice of film, there was a part of me that felt like I could be playing with fire by picking a film that wasn’t conducive for a good time with your girl. But hey, I like to play with fire when it comes to the films I watch! Luckily though, it was a damn good watch! Yes the pace was slow in parts, and there were even some scenes I felt like they could have dropped altogether, but the true subject matter, mixed with the entertaining acting and largeish scale of the production, meant I really enjoyed it. Though my date thought a little more action could have been in order. The subject matter itself was one I had never really thought of before in any context, so as usual it was really cool being enlightened to a subject I had no previous knowledge of. Also if you need another reason to hate the Nazi’s, then this will give you one more, as seeing them destroy priceless artworks out of pure ego and spite because they couldn’t have them themselves, just brought a tear to my eye, and a small bit of hate to my heart. So though not my favourite Clooney directed film, this is still one I rate and would happily suggest to others to watch! 8.5 out of 10 from me!